Article: How important is Social Media check while hiring employees? How important is Social Media check while hiring employees? While finalizing on the candidate, it is a good practice to check their social media presence. However, reading too much into the social media postings of the candidate can also be very dicey. It already seems that it was a decade back when a candidate would share a resume/ CV/ biodata with an average length varying anywhere between 2 pages to 20 pages. HR would go through the resume for education, experience, family background, responsibilities and call a suitable candidate for face to face interaction. Cut to 2018. Almost every resume now looks like a copy paste of some template available on internet. The interview process has undergone many transformations over a period. It is no longer a one-way monologue. There are many shades from stress interview or a panel interview to a casual conversation. The objective is to know more and share more, as a cost of one wrong hire is way more than the time spent on hiring a candidate. The 15 to 45 minutes of interview, how so ever intense and in-depth, cannot bring out all the facets of a person. The interviewer gets to know only as much as is shared by the candidate. After all, interview is not a natural setting. Hence there is a trend towards referring and validating the candidates claims against the information available on social media. Social media today has a broad canvas right from Twitter, Whatsapp, Instagram, Linkedin, Facebook etc. Based on one’s likings/ preferences, inclination an individual may publish on a social media platform. Some of these are professional networking forums while others are personal and non-business. While finalizing on the candidate, it is a good practice to check their social media presence. This does give an insight into the person’s social interactions, thought processes, perspective on various aspects of work and life. Some of the posts do indicate the individual’s social or political inclinations, causes which are close to heart and its impact on the individual as well as work preferences. It is said that birds of same feather flock together; this applies to people behavior on social media as well. The kind of company that the candidate keeps or has in the network, gives away a lot about the candidate. While on the one hand, the younger generation may be more inclined to share photos and video or experiences, the older generation normally shares incidents, descriptions, events, books, poems etc. The difference is in the speed and depth of what is being posted, liked and shared. Also, there are many who may not be very good with words but can articulate well through photos and videos. If one would like to scan for people skills, one can find a wide variety right from attention to details, to tact/ diplomacy, ability to speak up, humility etc. Scanning through social media is also a skill by itself. A mere word search or superficial viewing of profiles does not convey a lot. The recruiter should be social media savvy, connected with right people on the network, should be able to project appropriate image of self and organization so that appropriate candidates surface in the searches. Social media is after all based on the searches-what you look for, you get. Another point to keep in mind, is that the social media posts are a shot at a point in time or it shows only the picture which has a particular context. Taking out the post or picture out of context may have a completely different meaning. Today, there is a huge influx of fake news, fake posts and too many manipulations which does not project the right picture of the candidate. Basing decisions of hiring, without knowing the authenticity of the social media posts, can be a very dangerous approach to hiring. In addition, there are way too many incidents of hacking of social media pages and forums. With the popularity of social media and awareness amongst candidates and the fact that hiring managers do refer to social media, many people make a lot of effort to put across a very carefully crafted image, which is like playing it to the gallery. In fact, some go to the extent of hiring professional advisors who help build a social media image. In such a case, reliance on social media posting may not be the right approach. Reading too much into the social media postings of the candidate can also be very dicey. 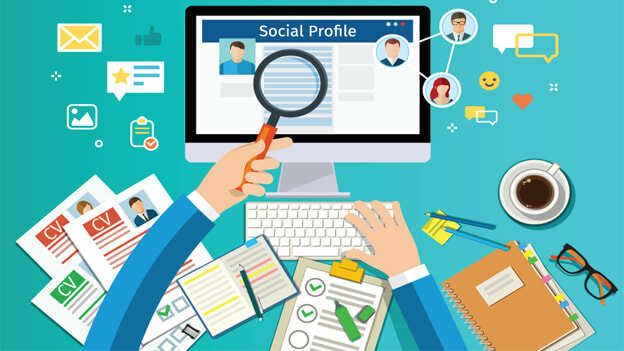 Although it is strange that people post very intimate and personal information on social media platform but when a recruiter brings it into the discussion, the candidates feel offended and consider that the organization has a culture or tendency to pry into personal lives of employees. Hence, reference to social media can be a very tricky situation in the hiring process. To top it all, not all good professionals or experts believe in social media. A large number of them believe in absence as a better choice than presence. Lakshmi Murthy is the Chief People Officer at ITM Group of Institutions.